Futile excitement is probably the best way to describe the mood in Turkey’s far-right Nationalist Movement Party (MHP), the fourth largest in parliament, after rebels announced they’d collected enough signatures to summon a meeting of the party’s main decision-making body. Opponents to Devlet Bahçeli’s 19-year leadership have been quietly plotting his downfall after a shoddy 2015, in which the party won and promptly threw away the chance to eject Recep Tayyip Erdoğan’s AK Party from government. 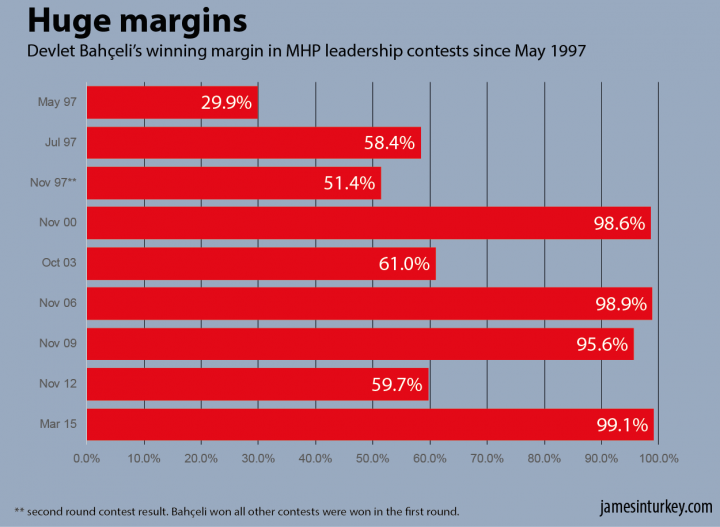 The rebels are excited because they’re on the verge of success: an extraordinary meeting of the MHP’s Grand Congress has not been called in nearly two decades. But it’s likely to be in vain, because the party’s rules make it astonishingly difficult to eject Mr Bahçeli. The MHP’s rulebook was last updated in November 2009. The more patient among you can have a look at it for yourselves here. The rocky, often insurmountable road to toppling an MHP leader takes us through a meeting of the Büyük Kongre (Grand Congress), a collection of MPs, party executives and regional delegates that is so large the party normally needs to hire a sports stadium to fit them all inside. This is the supreme decision-making body in the party, authorised with making final decisions on all manner of party activities and policy. That includes the leadership. Grand Congresses are normally held once every two to three years, but under article 63 it possible to summon an extraordinary meeting. This can be done at the whim of the party leader or its executive committee, or with the support of one-fifth of the party’s delegates. Note that Turkish political parties distinguish between party members and party delegates. As of 30 December, the MHP had 440,169 registered members. They are represented at a Grand Congress by a far smaller number of delegates. 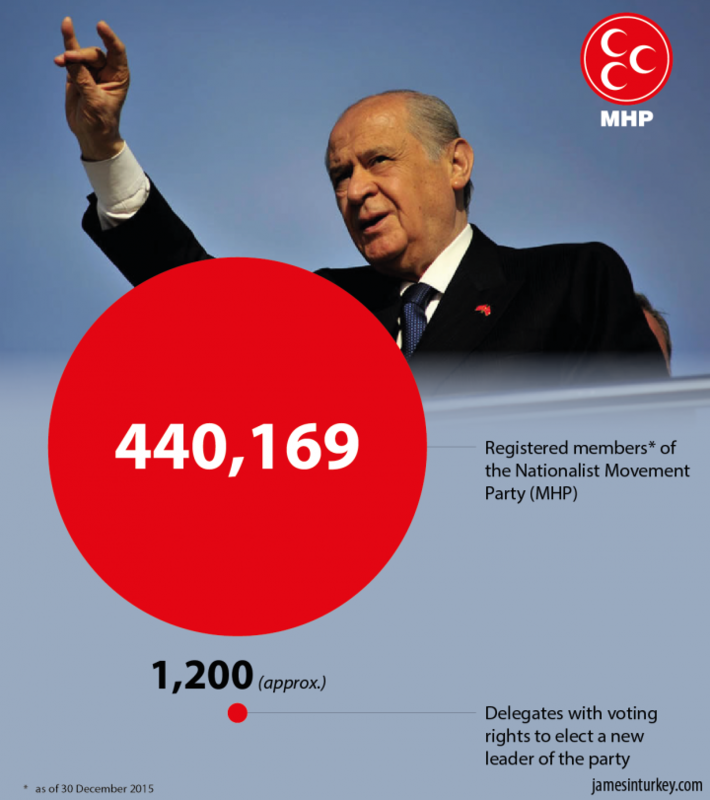 The vast majority of the MHP’s party delegates – a number equal to twice the total number of MPs in the Turkish parliament, or 1,110 of them – are elected, chosen as representatives by regional branches of the party. They are supplemented by a small number of so-called “natural delegates”, which includes the party’s leadership team, its founding members and its MPs. All delegates, natural or otherwise, each have a one vote. This makes for around 1,200 voting delegates at a regular MHP Grand Congress. So far, so straightforward. 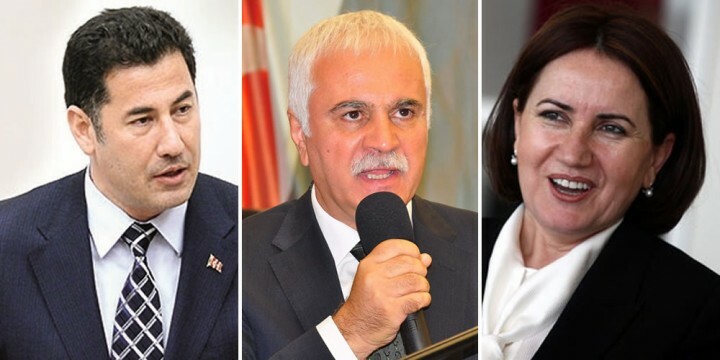 The problem for the anti-Bahçeli rebels is that the rules dictate extraordinary meetings can only be called to discuss “issues” – not for an election. You can’t use one to topple a leader. Only “ordinary”, regularly-scheduled GCs can be used for elections, and the most recent one was held in March 2015 where Mr Bahçeli stood unchallenged. That means his leadership is secure until as late as 2018. Bahçeli’s critics are thus calling the extraordinary GC in a bid to change the MHP’s rulebook itself. A leadership contest under the new rules would then follow. Sinan Oğan, who won a legal challenge after being kicked out of the MHP. The trio have united their forces to try and collect enough delegate signatures to force an extraordinary Grand Congress. As of yesterday, they claimed to have more than 248 – the bare minimum they need. But the obstacles in front of them are clear and numerous. Let’s count four for now. First, there’s no guarantee the attempt will succeed. The rulebook grants MHP headquarters a whole month to examine the petition and decide whether it is valid. Press reports suggest figures close to Mr Bahçeli are gearing up for a forensic examination of every delegate signature, hoping to find grounds to reject enough of them to push the petition below the one-fifth threshold. Second, even if a congress convenes, a rule change requires the backing of a majority of delegates – and there is no guarantee the rebels have that level of support. It is perfectly possible for Mr Bahçeli to turn the meeting into a show of force. Third, time is an issue. The rebels are collecting signatures so that they can meet to change the rules to allow them to meet again and challenge for the leadership. This process could drag on for months. Fourth, remember that Mr Bahçeli has stood for the leadership of nine separate occasions. Even the most turbulent of these contests ended with his victory – including 2003, the year after his party crashed out of parliament in a woeful election performance. His 19-year leadership won’t fall without a fight. Expect a messy one. There is some reasons why AKP won the Nov 1 elections. First of all, HDP leader Demirtas was falling under the control of KCK’s hawkish leaders (Duran Kalkan, Cemil Bayik, etc.) and didn’t say anything about YDG-H attacks against police, soldiers and civilians. Second of all, Devlet Bahceli has a really stubborn and uncooperative attitude when it came to forming a coalition government, which led to him loosing 1/2 of his seats in the Turkish Parliament. Third of all, CHP leader Kilicdaroglu cannot push his party above 30 percent due to the fact he doesn’t know how to listen to others and doesn’t know how to appeal to other people either. Fourth of all, the leadership structure in the CHP and MHP is very authoritarian and lacks transparent democracy. So the reason why opposition parties cannot win is due to the lack of democracy in the opposition as well as having leaders who are old and with lack of a vision. Btw, and I am not really much of a pro government person to begin with.